Back in ’86, I was onstage at the Met Opera House in NYC singing and dancing backup in one of the nation’s first big AIDS fundraisers. Among the stars and large-cast Broadway show ensembles there was a sudden rush of excitement as the habit-attired actresses from then Off-Broadway smash hit Nunsense whipped the audience into a frenzy with their rousing number “Holier Than Thou”. Amidst the glittering stars including Bette Midler, these actresses had achieved something akin to cult status with one single number. Something similar happens at the end of Encore’s NUNSENSE which opened last night in Dexter. After a fast-paced evening of hit-and-miss jokes, skits, and gags, the stage explodes with energy as Amy Smidebush leads the ensemble of superb performers in the rousing “Holier Than Thou” and you can forgive Dan Goggin’s misfires, and take pleasure in the wonderful things he does create. It is really not worth reviewing Nunsense the musical for content since it has entered the amateur and regional theater reportoire and is done virtually everywhere. Barbara Cullen’s direction and choreography is fast-paced and fluid; Leo Babcock has designed an excellent parochial-school gymnasium set; George Cullinan’s musical direction is very good and he and his ensemble sound great (no orchestra members are credited in the program); Dan Walker’s lighting works well; an Sharon Larkey Urick’s nun’s habits are both classic and adaptively hilarious. Sue Booth “wrings” the most out of hers, to be sure. But oh what a jolly gaggle of nuns we have in Encore’s very strong all-female cast: The aforementioned Amy Smidebush plays Sister Mary Hubert who is second-banana to Barbara Scanlon’s hilarious Mother Superior Sister Mary Regina. Barbara’s “unexpected discovery” is worth the price of admission by itself. But wait, there is a terrific performance by Mary Rumman as Sister Mary Amnesia (and low and behold, the theater gods have finally smiled upon Encore as they present their first DIRTY JOKE in their otherwise too-family friendly fare…albeit a joke that all 9-year old Catholic boys are well familiar with). And then there is dancing Sister Mary Leo, a spot-on Madison Deadman who as the ensemble’s youngest member brings strong stage presence throughout. Top it all off with the self-assured performance by Sue Booth as Sister Robert Anne and you have a dynamite cast of nuns. By the way….did you catch that?…Sister MARY Regina….Sister MARY Leo…Sister MARY Amnesia…Sister MARY Hubert…Sister ROBERT Anne…Yeah, the whole night is filled with gags like that. 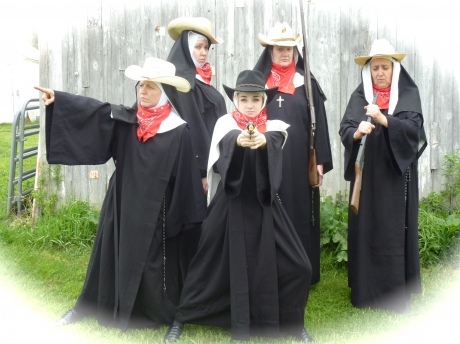 Its almost incomprehensible that Nunsense has spawned not one, but six sequels. But it is what it is — and that makes for a highly entertaining evening of nonsense, er, nunsense….Play on, ladies, play on. NUNSENSE continues at Encore Musical Theatre Company through June 10th. Tickets can be ordered online at theencoretheatre.org, the box office, or by phone at 734-268-6200.